On Wednesday, May 18, 2011, one of Charles Wilson’s dreams became a reality. 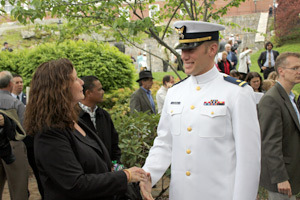 Cadet First Class Wilson walked across the stage at the U.S. Coast Guard Academy last week to receive his diploma and shook hands with the President of the United States. Wilson grew up in Savannah, Ga., and by the time he got to high school, he started skipping classes, undermining authority and getting into trouble. By his junior year, he realized he needed to make some major changes in his life. 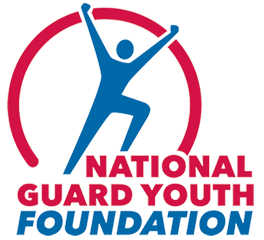 It was through a neighborhood friend that Wilson learned about Youth ChalleNGe and enrolled in the ChalleNGe Program at Ft. Gordon. It was there that he realized he was responsible for his own actions and success. Being away from his daily distractions, he was able to focus on improving himself and setting goals for his future. “I am where I am today because of Youth ChalleNGe,” said Wilson, the week leading up to his graduation from the Coast Guard Academy. Following Wilson’s graduation from ChalleNGe in 2001, he enlisted in the Air National Guard and started taking classes at Georgia Military College. While he was enlisted in the Air National Guard, he was exposed to missions that motivated him to apply to the Coast Guard Academy. In May of 2006, Wilson got a call from the assistant director of admissions at the Coast Guard Academy who told him he had been accepted. The assistant director told Wilson he was an unconventional candidate, being a high school dropout and an applicant from a different branch of the service. The Foundation is absolutely confident the newly commissioned Ensign Charles Wilson will serve his nation honorably. We are proud of his success and look forward to hearing about his future endeavors. Wilson is the second graduate of ChalleNGe to attend one of the nation’s service academies.